Extruded heat sinks are made by first heating aluminum until it is soft, then pushing the softened metal through a machined die in the shape of the heat sink profile. Once the length of the heat sink has been reached, the extruded heat sink is cut from the die, and is then cooled and prepared for use. This process creates a solid structure that can be bonded directly to the heat source. This heat sink type is the easiest to manufacture, due to having fewer steps in the manufacturing process. Also, because the fins and the heat sink base are extruded as one unit, the thermal flow path is uniform, ensuring excellent thermal conductivity from the heat source to the fin surface. Additionally, extruded heat sinks have higher structural stability. Aluminum is also very flexible in the kind of surface treatment available, as it can be anodized to different colors, or chromate or nickel-plated. The flatness and surface roughness is a critical component of the manufacturing process, as this determines the effectiveness of the thermal interface with the heat source. Novark uses Aluminum alloys AL 6063 and AL 6061 for most of its aluminum extruded heat sinks, and AL 6082 for certain applications. 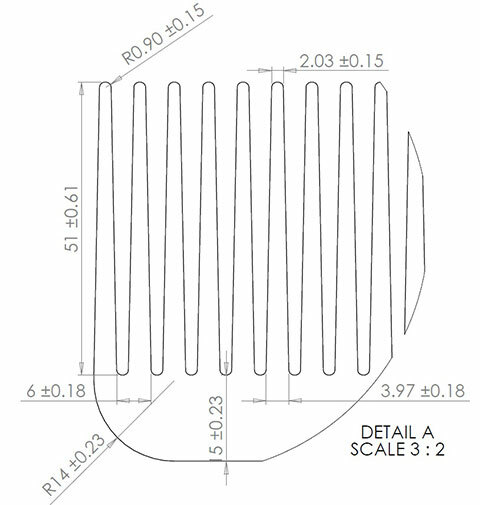 Novark recommends extruded heat sinks with a ratio of fin height to average fin thickness of 13 to 17, though ratios outside this boundary are possible on a case-by-case basis. The drawing below is an example detail fin profile, demonstrating the manufacturing tolerances specified in the table. Please contact Novark for a custom Extruded Heat Sink design for your thermal management needs. Privacy | Terms © 2019 Novark Technologies, Inc.